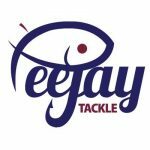 I’d booked the Friday off work for a little practice before the Champion of Champions Final next week and after not fishing last Sunday, I was gagging to get back on the bank. My back was still not 100% but a lot better than it was so I decided to give it a go as I was climbing the walls at home! The forecast was pretty grim for later in the day but on waking up, it didn’t look too bad outside. I loaded the car up and was a little apprehensive when it came to lifting the box but it wasn’t too bad. A quick pit stop for breakfast at the Little Thief and I was on my way with my wallet a tenner lighter. I arrived with ten minutes to spare and had a coffee and said hello to everyone, the draw time arrived and Jeff got me to pull out the golden peg which turned out to be choice number four as it was a rover today. With the golden ball back in the bucket, I drew again and pulled out choice number one, the trouble is I never seem to do very well when I have my pick of the pegs. After everybody had drawn, it was time to chose and I went for peg 34 as it’s been a really consistent area. Rob Birch went for peg 32 and Roger chose 38. One of the best pegs on Longs but would I do it justice? As per usual I set up a 0.3 gram NG Mini Gimp for the top two lines left, middle and right and also at five metres straight out, the other rig was a 14 x 11 MW F1 Slim for two ten metre lines, one fed with micros, the other with Special G Dark groundbait. On the side tray I had 2mm Bait-Tech Carp and Coarse Pellets plus some 4mm Xpands for the hook. 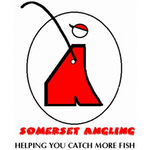 On the whistle I fed micros short left and middle and cupped in a ball of groundbait on the right, fed a pot of micros at five metres and then micros at ten metres straight out and groundbait at the same distance but angled to the right. I started on the top two line to the left and after a few minutes the float sunk from view and for once I didn’t miss it and netted a 4oz skimmer, I had another next put in and then missed a couple of bites before adding a third. I then had a foul hooked carp that gave me the run around, I had another skimbob but when I hooked another carp it was time for a move. 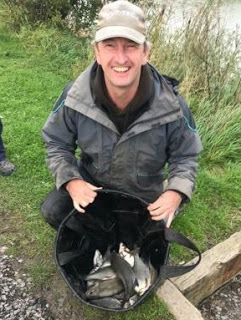 I went to the middle line and had another hand sized skimmer before catching two better ones in quick succession and just before the first hour came to a close, I had another of 4oz or so to put me on eight for around 2.5lb, not bagging but steady and as I thought 12lb would be a good weight, I was just ahead of my target at this early stage. I’d seen Roger net a couple of skimmers and Rob appeared behind me to ask how I was doing and said he was getting a few. 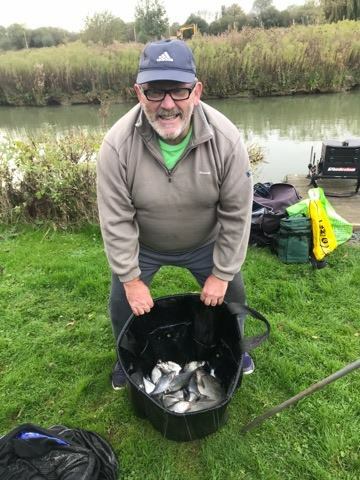 As the second hour started, I tried the right hand short line but never had a bite, back on the middle line and the rest had done it some good as a couple more skimbobs put in an appearance. A few more 4oz fish followed and then I had one around a pound and I was up to 5lb after two hours and it was going well. 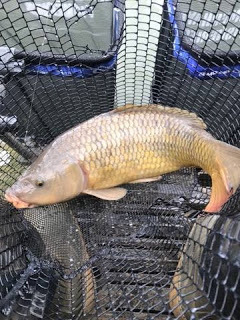 Things got even better when the next bite resulted in a two pounder flying out of the water, I safely netted it, two more smaller skimmers followed and I was really enjoying myself, I was just thinking that I hadn’t hooked a carp in over an hour when the next bite resulted in a pond pig tearing off. I rotated around the three short lines for the next half an hour but every bite over the micros resulted in a carp and I couldn’t get a bite over the groundbait. Rob stopped on his way up to see Roger and said he was getting carped out as well. I needed to use the loo so fed all my lines before I went, on my way back I asked Roger how he was doing and he replied that he’d only had five small skimmers. 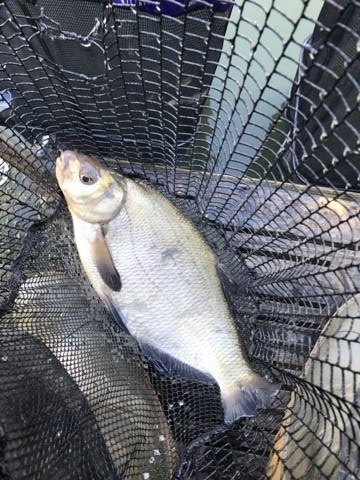 Back on my box, I went over the ten metre line for the first time and the float had barely settled before disappearing and another carp ran me ragged, after netting it I decided to give it another go but the next bite resulted in blue hydro all over the place and that was enough of that. I wanted to leave the five metre line until the last couple of hours so came back on the top two lines but it was the same story and I was running out of hooklengths fast. 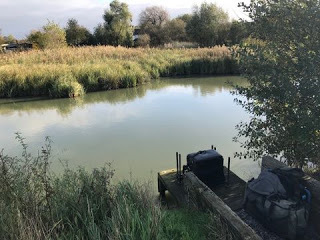 I did manage one more skimmer over the next half an hour but it was hard going so with two hours to go I tried the five metre line for the first time but three carp in three chucks and I didn’t know what to do next. I came back on the central top two line where there were loads of blows but they looked very carpy, I had a couple of fish that I was sure were skimmers but they somehow turned into carp and then out of the blue I had a decent skimmer of a pound or so and was probably up to 8lb or so and there was still an hour left. I kept thinking I could still pull this out of the bag with a couple more big skimmers but it didn’t happen and I only managed one more 6oz fish. 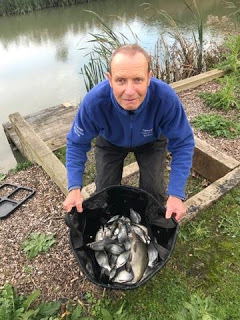 I packed up and just as I finished loading the car, the scales were with Roger who weighed 4lb 10oz, I was next and my 21 skimmers and a few tiny roach went 10lb 6oz which was a little more than I thought but I didn’t think it would do me any good today. Rob weighed 4lb 1oz and when Gary Butler had 5lb 11oz I started to think I might sneak in, especially as Jeff was admitting to 8lb. I should have known better as he weighed 12lb 1oz and when John Barker said he had 10lb or so I knew that was that, he actually weighed 10lb 13oz so it had been tight. I’d wanted to use today as a practice for next Friday but I’m none the wiser, that’s three times I’ve drawn in the 30’s and not done very well although to be fair I wasn’t far off today but I’m not getting it right. I hadn’t lost or bumped any silvers although I had missed a few bites.